Students use a dictionary to find meaning, syllabication, pronunciation, word origin, and parts of speech of familiar and unfamiliar words. Then they work in groups to go on a dictionary scavenger hunt. Finally, they use their new vocabulary in original writing. In this experience, students use a dictionary to find meaning, syllabication, pronunciation, word origin, and part of speech of familiar and unfamiliar words. Then they work in groups to go on a dictionary scavenger hunt. Finally, they use their new vocabulary in original writing. Students need to have access to print and digital dictionaries in this experience. Students will work in small groups in Scene 4. 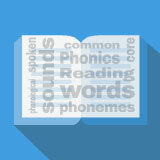 Use a dictionary to determine word meaning, pronunciation, syllabication, word origins, and parts of speech. Use new vocabulary in original writing. Every time you read something new, it’s a chance to expand your vocabulary. Instead of sailing past an unfamiliar word, stop. Break it down into syllables. Do any parts of it look familiar? If not, consider whether context offers clues. Still unsure of its meaning? Use a dictionary, either print or digital. Dictionaries offer more insights into language than just word definitions. Imagine looking up the word cyclone and finding it has its origins in Greek. You look more closely. It turns out the Greek origin word kukloma means a coiled snake or a wheel. Since a cyclone is a dangerous rotating wind, the wheel and snake analogies work. Dictionaries can tell you the part of speech it is – in the case of cyclone, a noun. They can teach you how to pronounce a new word. That lets you use it in conversation. And they can show you how the word breaks down into syllables, which can further help with the sound-print connection. In this experience, you will practice your dictionary skills. Look up the word rummage. Find its part of speech, word origin, and definition. Post a fact about the word. Examples might relate to the word’s 15th-century Dutch origins (room), its Old French origins (arrumer/arrumage, to stow in a boat), a definition (to search unsystematically through something), or that it can be a verb or a noun. The Complete List of Learning Experiences in Foundational Skills Unit. Would you like to preview the rest of this learning experience, and get access to the entire functioning ELAR Grade 6 course for your classroom? Sign up using your school email address below.